Before I am going to start this article, any cliche you have ever heard about Italy, from it`s stunning beauty, to it`s great food and scolding car drivers – I can assure you it is true! The vibrant Riviera on Italy`s northwest coast is one of the best places to experience the heart of Italian “Dolce Vita”! Small fishing villages with colourful houses tucked into hills are overseeing the turquoise blue sea; gems like Portofino and Santa Margherita have been long been discovered by the rich & famous – and it`s time for you too! I arrived in Liguria without any expectations, a short weekend getaway on the ocean, to a place I hadn’t been before, that was all on my mind. – What I discovered was a piece of paradise! 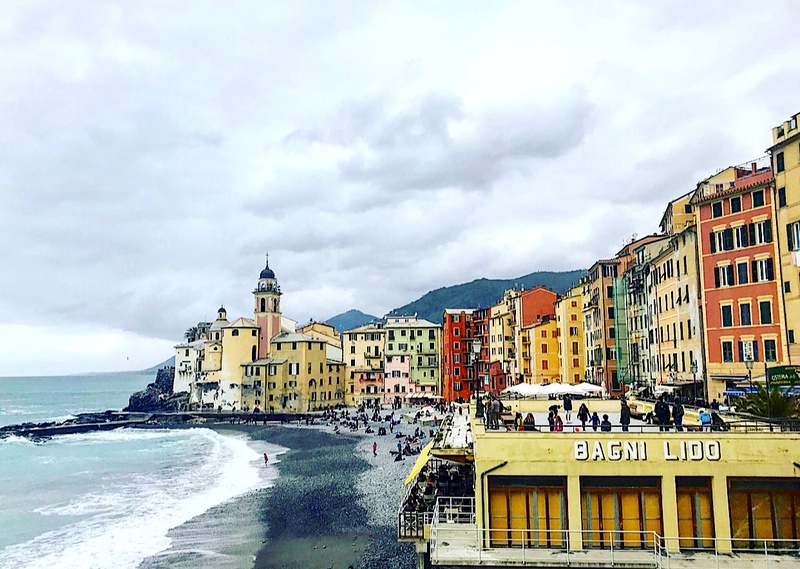 The crescent-shaped coastal region around Genoa stuns with small fishing villages, beautifully coloured houses set against the turquoise blue of the Ligurian sea. Bordered by the French Côte d`Azur to the west and Tuscany to the east, Italy`s Riviera hides some of the most picturesque towns, Santa Margherita, Portofino and Camogli – only to name some. Nestled in a Mediterranean landscape, narrow terraces are clinging to the hills, where olive trees, lemons & mandarins are growing in the scent of fresh herbs. 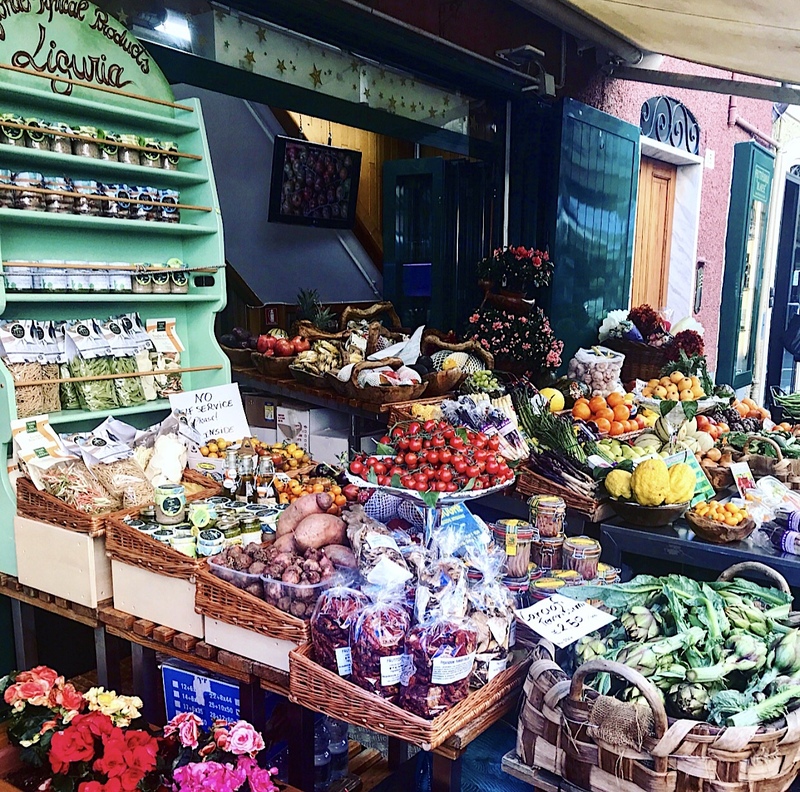 The photogenic nature not only determines the beauty of the coastal region, but also the characteristical flavours of the Ligurian cuisine, which is famous for it`s pesto, focaccia & fresh seafood. 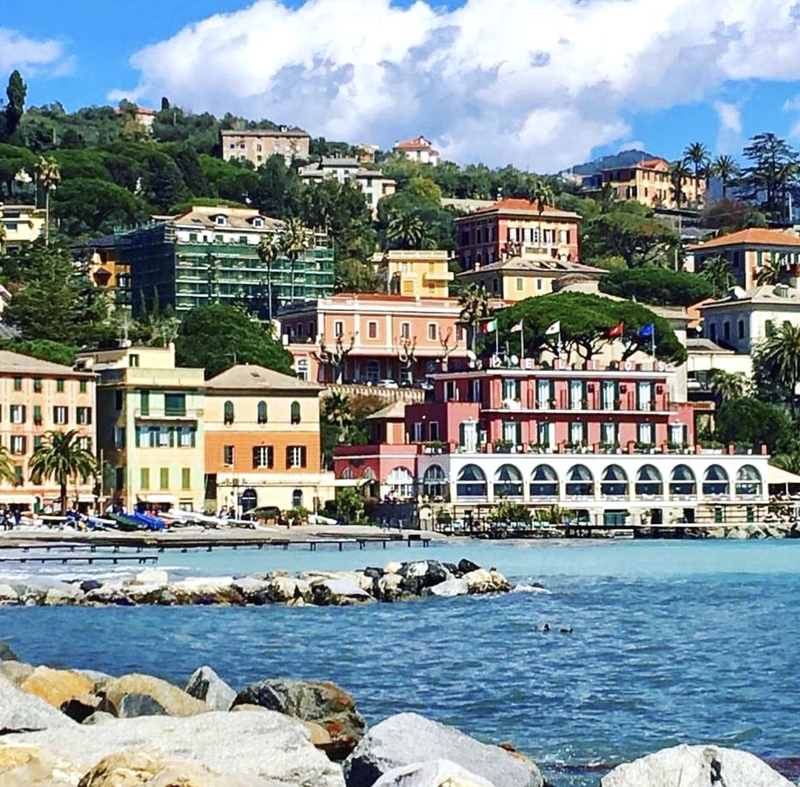 Our first stop is Santa Margherita Ligure, a picturesque town located about 20 miles east of the metropolitan city of Genoa. A large statute of the Genoese explorer Christopher Columbus overlooking the ocean, reminds of maritime power & great expeditions to the New World. The surrounding harbour is a central place for local fishers and their swaying boats. On sunny weekends, the beautiful seaside promenade attract tourists & families for a stroll under shady palm trees. At the heart of Santa Margherita, Piazza Caprera is located. 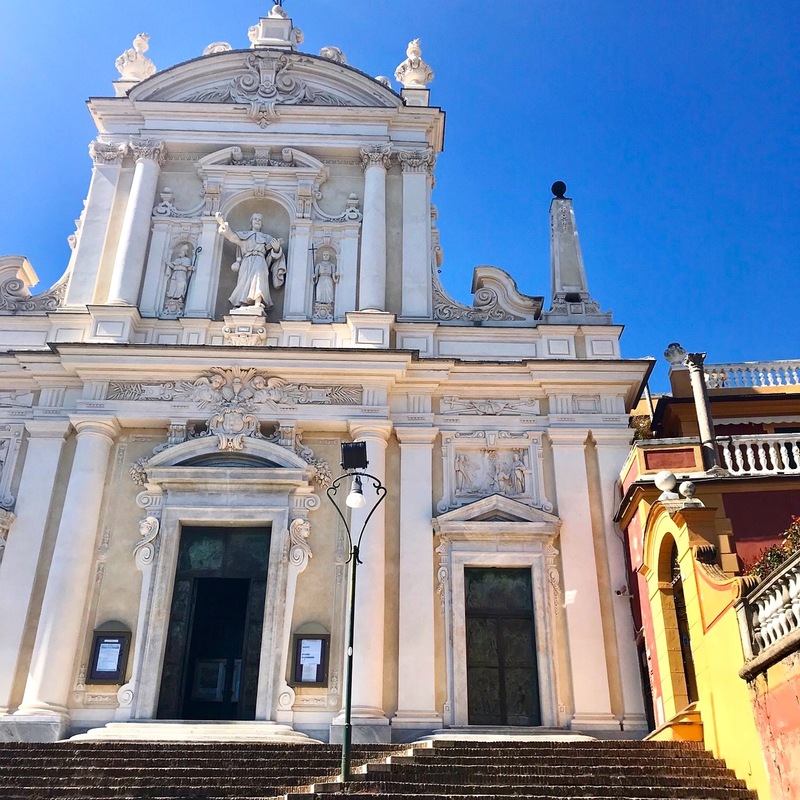 The center of the lively square forms Santa Margherita d`Antiochia Church, surrounded by beautifully renovated old facades. 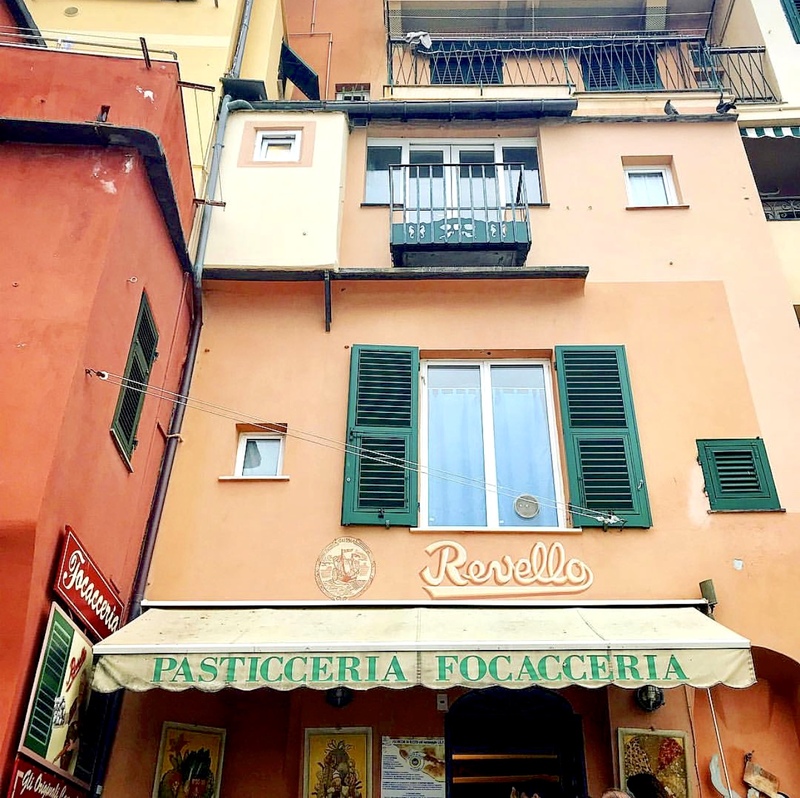 Peach-colored houses rise up into the blue sky, like the paintings & artwork sold at the piazza. In the side streets of the bustling square, lively Italian debates take place. Market stands with fresh fruits & small cafés are adding to the hustle of the picturesque scenery. Picture in picture. 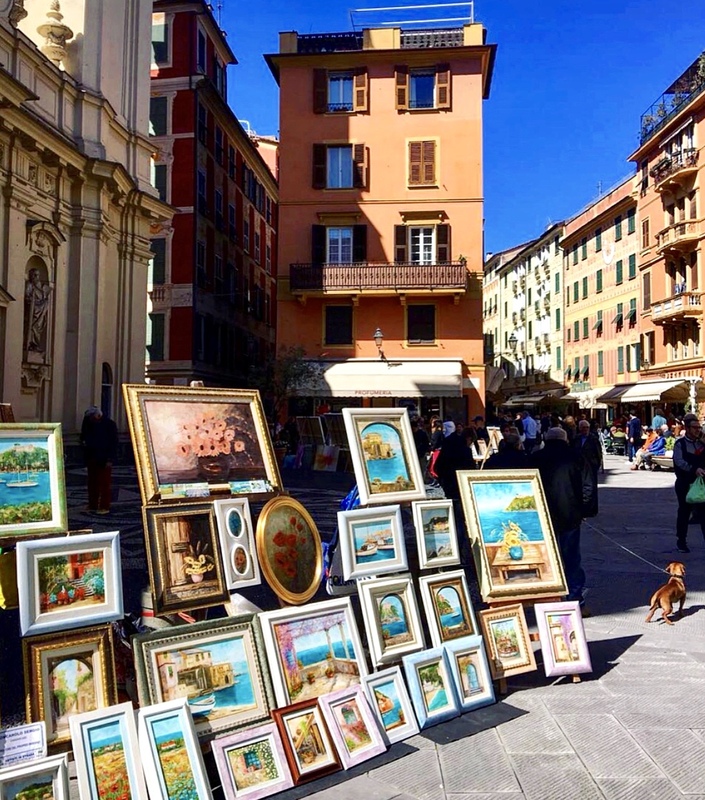 At Piazza Caprera, art blends into reality with colourful paintings and house facades. 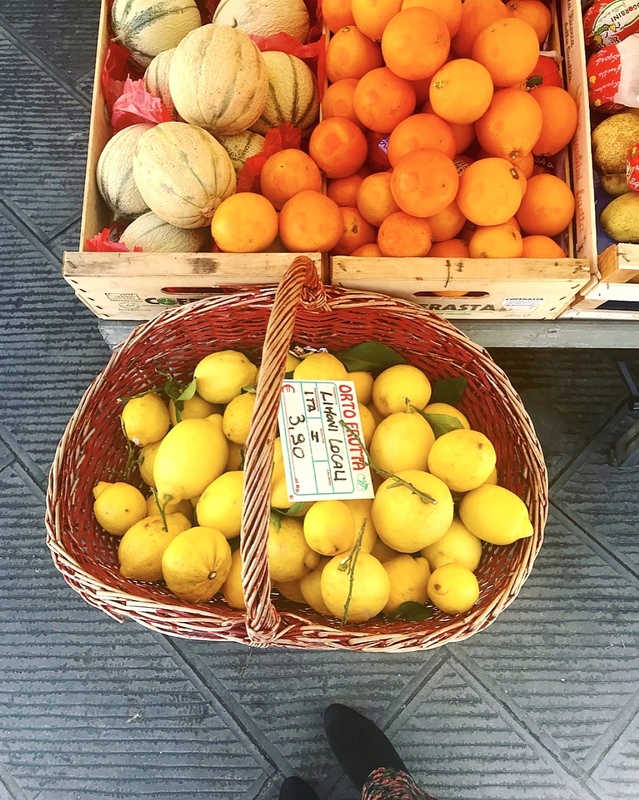 Lemons, mandarins, oranges & citrons growing in Liguria can be traced back to the 14th century, when San Remo shipped 50 000 oranges to Avignon in a single year and exchanged lemons for grain with Arles. By the 17th century the extraordinary volume of citrus in Liguria perfumed the air itself, so that Giovanni Battista Ferrari rebaptized the Gulf of Genoa in his book “Hesperides” to “the perfumed sea”. the Gulf of Genoa to “the perfumed sea”. 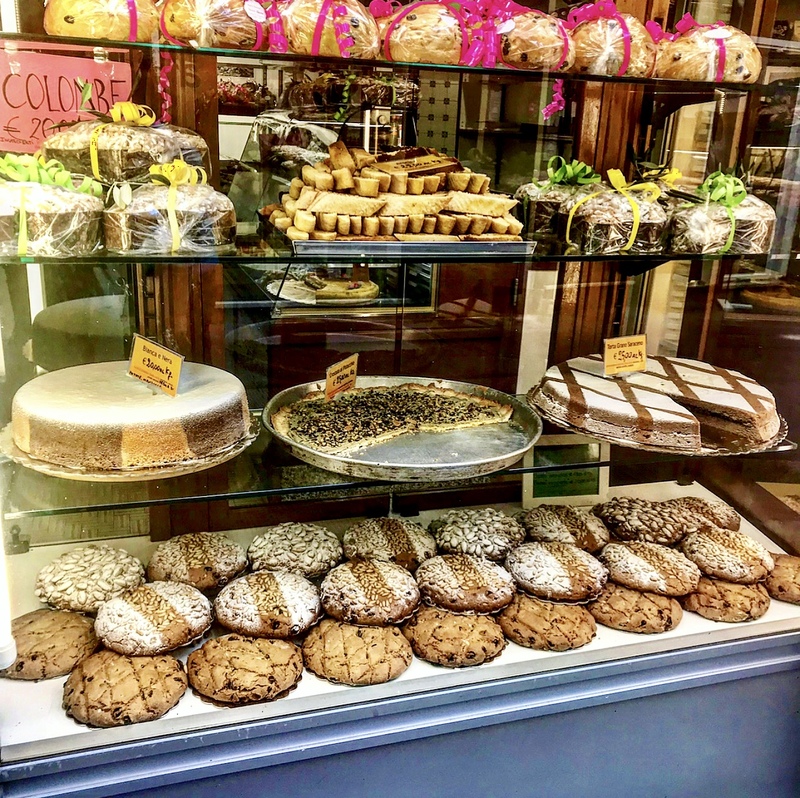 In small bakeries, cafes & shops local products and a piece of “Dolce Vita” can be tasted. A walk up the steep stone stairs to the Baroque Church of San Giacomo in Santa Margherita, unveils a wonderful panorama of the coastline. The adjacent Villa Durazzo with it`s exotic centuries-old Garden, is a hidden piece of paradise with captivating views of the Ligurian sea! Villa Durazzo with it`s ancient garden, a popular location for weddings, events and photographers. Panoramic views from Church of San Giacomo over the bay of Santa Margherita Ligure. “A small village, Portofino, stretches crescent-shaped along the edge of this calm bay.”, Guy de Maupassant wrote when describing Portofino. The times of calmness in Portofino are long over. In the summertime, the idyllically located fishing village, which counts no more than 500 residents, is the playground of the international Jetset. From Jay-z & Beyonce, to Denzel Washington and Madonna, there is no celebrity, that the fishing village has not seen flaunting to board their private yacht. 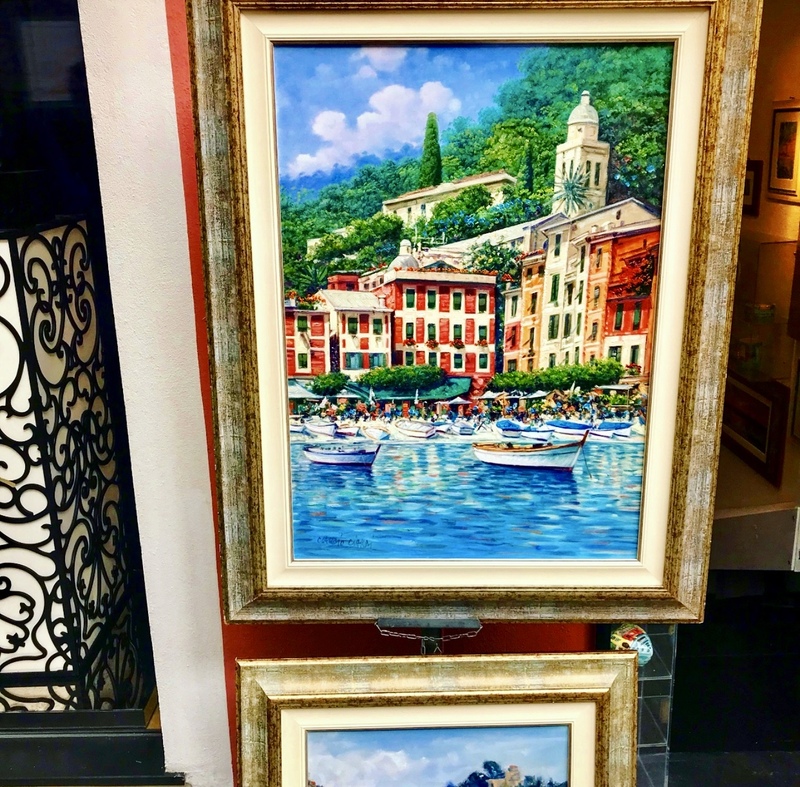 Most visitors who flock to Portofino, are happily accepting higher prices to once experience the flair of the picturesque village. Around the piazetta, aesthetically renovated houses are wearing their most beautiful dress – just like in the picturesque images of Portofino`s bay, that are decorating walls all over the world. The stone alleys of Portofino are lined with luxury boutiques and restaurants. 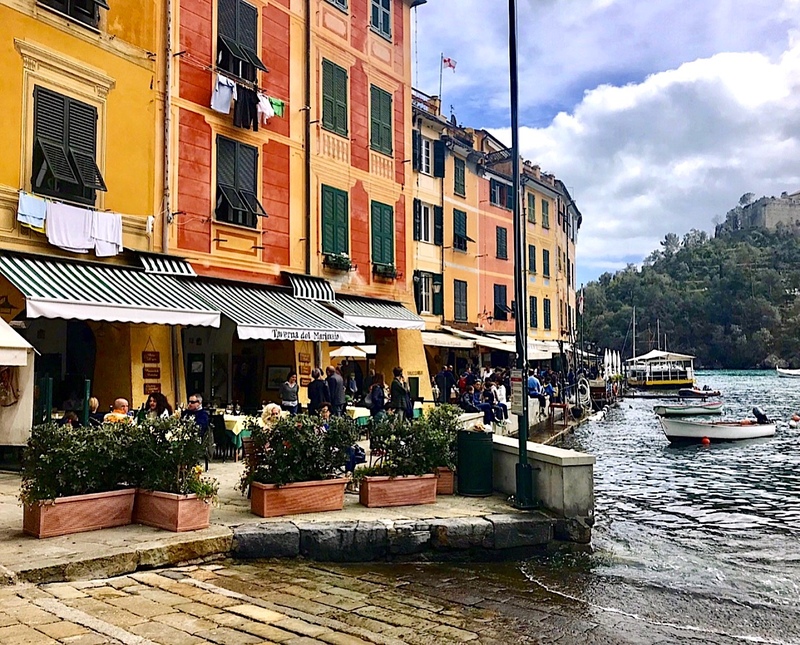 Prices are solid, but most visitors who flock to Portofino, are happily accepting this minor inconvenience to once experience the flair of the picturesque village – and a sent of stardom. According to the legend, the name Portofini comes from Portus Delphini because of the great number of dolphins that populated it`s sea. To experience calmness in Portofino, however, you have to be very early, off season or visiting on a bad weather day. – Then, the true idyll & beauty of Portofino comes to light. 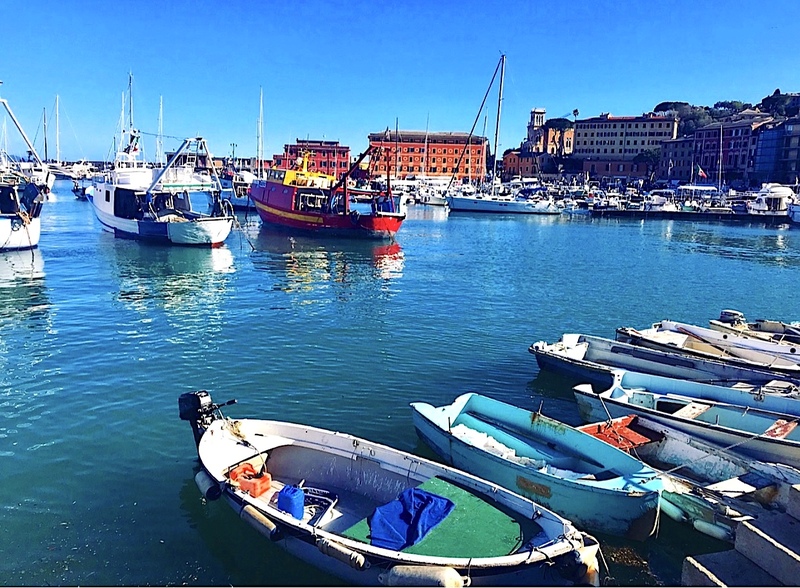 The role of fishing in the lives of Ligurians has declined nowadays, nevertheless, the fisherman villages are still insuperably tied to the sea. A fact that is particularly apparent in Camogli, a small town with unique seaside setting. 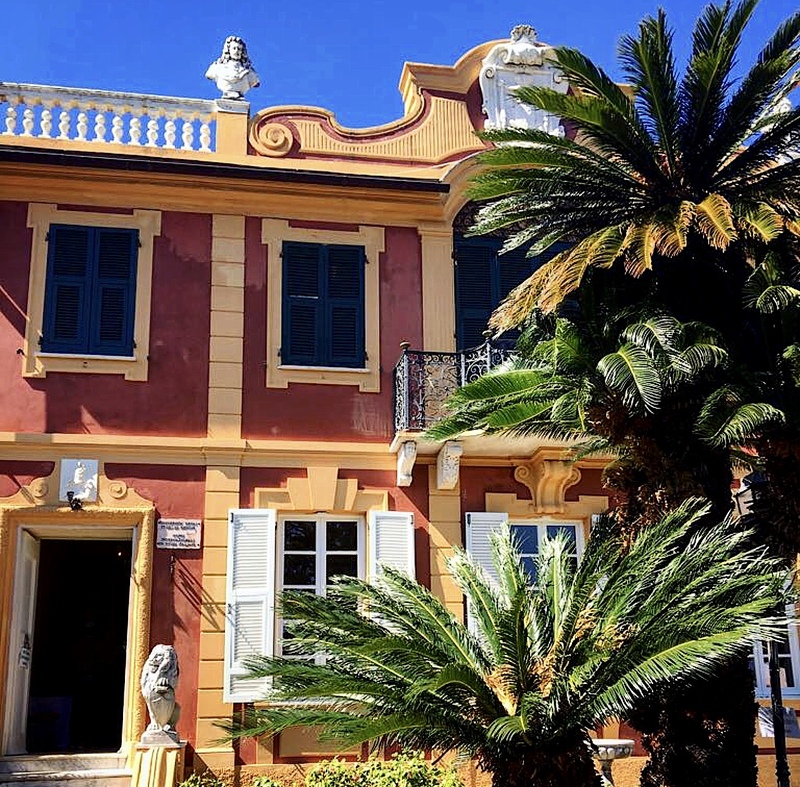 Houses in rainbow colors are nestled in the hillside looking out to the sea, like the women who once watched over the town while their fishermen husbands were away – giving the town it`s name Camogli (Casa delle mogli). When the waves are breaking into the rocks around the retro-style Bagni Lido (beach bath), it seems as if time had been standing still. Focaccia Genovese is one of the specialities of Ligurian cuisine. The thin bread that is made from flour, water, yeast, salt and oil extra virgin (and that’s all!) is popular all over Italy – and an essential taste of Liguria! Genoa, the capital of Liguria, has historically been one of the most important ports on the Mediterranean. Due to its glorious past Genoa has been nicknamed also la Superba (“the proud one”). The birthplace of Christopher Columbus reminds with various impressive landmarks of Genoas glamorous role in maritime trade over many centuries. 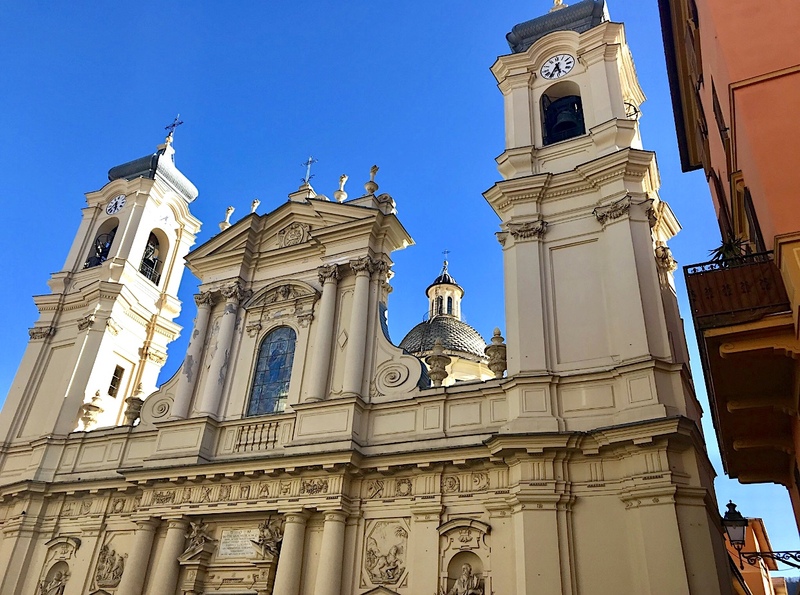 In the old town of Genoa, the characteristically black-and white-striped Cathedral of San Lorenzo rises above ancient streets. For those who want to feel old Fishermans flair, a visit to Boccadasse, an old mariners neighbourhood, is recommendable, where young locals catch up at night for a kiss. As we are leaving the coastline through hilly serpentines, I turn around one last time to say goodbye to the sparkling Riveria Levante. Today, as I am writing these words, I am still fulfilled with the bright colors of Liguria. 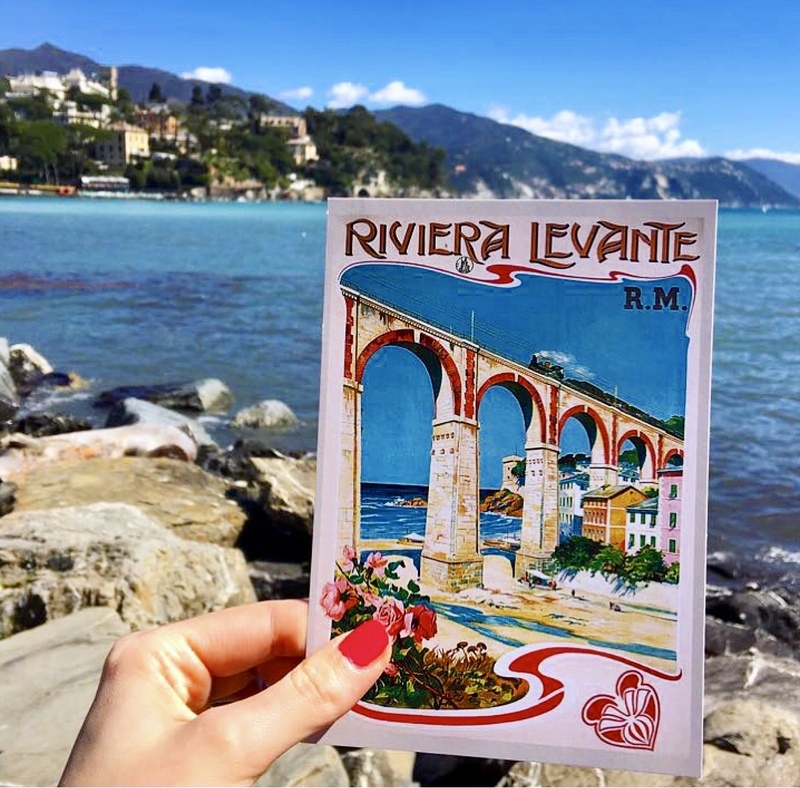 Should I once miss the mandarin-scented air & fresh breeze of the Ligurian sea – I still have my postcard from Riviera Levante! Spring is one of the best travel times. Summer is beautiful, if you don`t mind the crowds. Genoa is the closest large airport. By car, it takes a 2 hour drive (90 miles) from Milan to Genoa. The hilly area with panoramic views is perfect for a hike or walk. The fishing villages are close to each other and some villages, like Portofino, have a very limited amount of parking possibilities. Like in every larger Italian metropolis, you should watch your handbag when in Genoa and carry it in sight. Posted in Travel and tagged Camogli, Genoa, italy, Liguria, Portofino, Riviera, Riviera Levante, Santa Margherita. Bookmark the permalink. Liguria is a spectacular region and I love this post of yours :) So pretty pic of you with the 500! Yes, it is really a beautiful region! Thanks a lot, my new ride haha ;)! 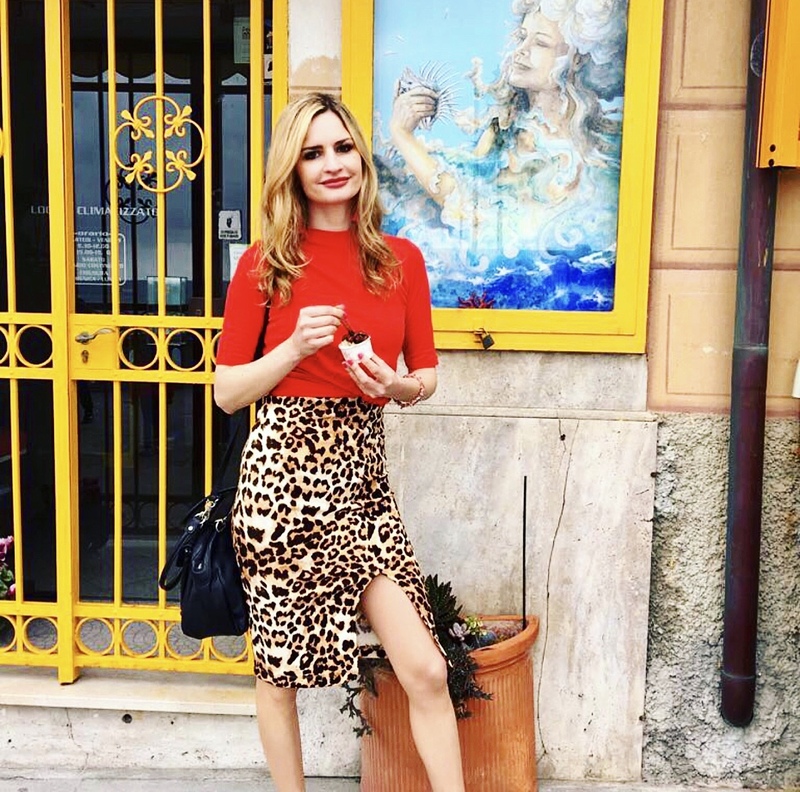 By the way, I Love your Italy blog! !